Smooth Sailing From LA On Saturday, a cruise ship, the Viking Sky, off the coast of Norway, lost engine power due to heavy winds and waves as high as 25 feet. In total, nearly 1400 passengers had to be airlifted off the disabled ship. Needless to say, Yelp reviews on this voyage will not be great. That being said, a cruise that does not end with guests being hoisted off of a boat by emergency helicopter can be a fun and relaxing vacation. Los Angeles is a great starting point for one of those sea-cations. How do we know? The Love Boat! Yes, the Love Boat, one of the enduring examples of the late 70s/early 80s television at its finest. The highly successful series ran for 10 seasons and 250 episodes, half with guest star, Charo. Well, maybe not half, but it sure felt like it. Watching the Love Boat taught viewers 2 very important lessons; firstly, a short cruise from LA to Mexico and back, can be the perfect way to find love and secondly, when your film and television career is at its lowest point there are still shows available to take it one step lower. At least the checks cleared. Seriously though, although the Love Boat was a fictitious show about romance on the high seas, from Los Angeles to the coast of Mexico, the actual journey was and is real. 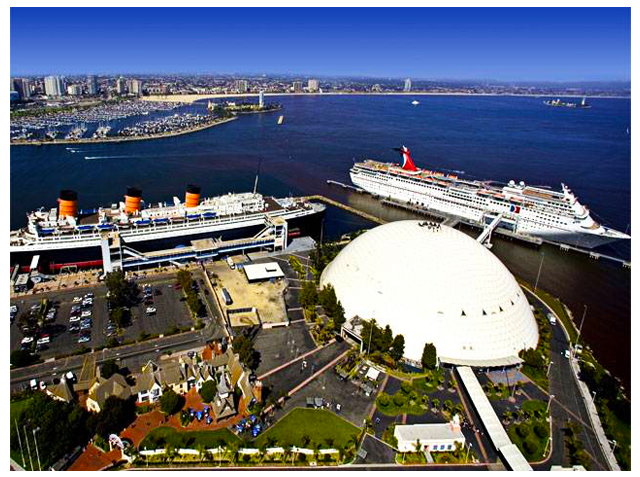 Because Los Angeles and its neighboring ports in San Pedro and Long Beach are the gateways to the Pacific Ocean, there is such a plethora of cruise options in Southern California, you would think that they would be giving these trips away. Well, guess what, they almost are… at least for some routes. A quick scan of cruise booking sites shows that there are at least twelve different cruise lines including; Carnival Cunard, Celebrity, Costa, Crystal Cruises, Disney Cruises, Holland America, Norwegian, Oceania, Princess, Royal Caribbean and The Yachts of Seaborn sailing from one of LA’s three main ports. In fact, there are more cruise lines leaving from LA than there are guys in Tarzana who use the word Dude as an adjective, and for the record, there are quite a few guys in Tarzana who do that. With all of this competition, pricing is incredibly reasonable, even on the more elaborate trips. The least expensive trips are the 4 and 7 day round trips to Mexico. With starting prices less than $200 per person, a trip to Ensenada will cost you less than one day at Disney’s California Adventure. Oh, and by the way, the biggest adventure at California Adventure seems to be dodging the thousands of strollers guests are attacked with, by parents who are clearly unhappy and want everyone else to share the pain, but that’s for another conversation. If Mexico isn’t for you, then there are several other destinations to consider including Hawaii, Alaska, Canada, South America, the South Pacific, Australia and even 3 around the world cruises, which will take you several months, but I guess if you can afford to be on a boat for several months then you probably can afford to take the time off from work, as well. 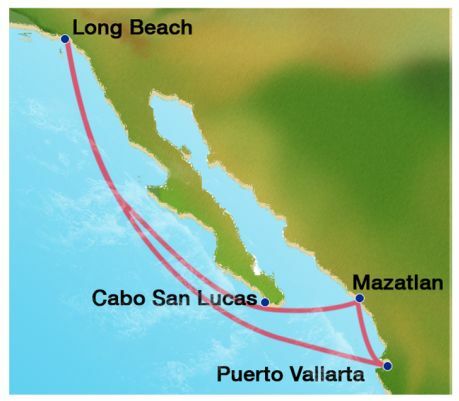 Sure, the more extensive the journey, the more it costs, but somewhere between the $499 7 day trip to the Mexican Riviera and the $79,000, 161-day cruise around the world, there is going to be a sweet spot for anyone looking to make an ocean journey. So, what do you get when you travel by sea? The easiest answer is seasickness, but with the proper amount of Dramamine and Vodka, getting ill due to the constant rocking of a ship is less of a concern. Instead, many cruises offer meals included, some even go as far as to allow for 24 hours a day unlimited eating. On the more extravagant trips, you will often see your cocktails included in the ticket price as well. A word of caution, unlimited food and drinks may sound good in the brochure but add in those rolling waves and maybe, just maybe, you might want to be a little more reserved with your dining and imbibing decisions. Along with a plethora of food and drink choices, many modern ships offer all the luxuries of home without the extra joy of having to walk the dog twice a day. Many cruise ships today are like floating small cities, with an array of stores, health clubs, and gyms, movie theaters, discos, office space (for the spouse that knows they must continue working in order to pay for all of the mini bar charges). There’s bowling, wave pools for surfing, zip lines, batting cages, casinos, even some amusement park styled rides. In short, there are a lot of things to do on the ships. An even bigger bonus is that the cruise lines know that much of their guests are families, made up of parents who can’t wait to get rid of the kids and the kids who are desperate to dump the parents and for that reason there are activities for both age groups, that will safely keep them away from each other for 10 or so hours each day. The modern cruise is the perfect place for families to enjoy spending as little time as possible with each other. Then, of course, there are the stops at exotic ports, where you and your family… or not, can take some time off of the boat, immersing yourselves in the culture of the destination. It’s a great opportunity to sightsee, shop and eat and drink. Oh, and it’s also a great way for the locals to point at you and make you realize just how completely unwelcome you really are. No, of course, that’s not true. Each of these ports grows their economy based on how much they can make you pay for something you’ll question buying 2 weeks after you get home. Wow, honey, I am really glad we found this seashell in the shape of a… hang on, is this supposed to be an ashtray or something you put olives in when guests come over? It’s these little trinkets from your trip that you’ll look back on years later when you ask yourself, why don’t I have more money in my savings? Again, just kidding, maybe. The point of all of this is that a cruise is a great place to do a whole lot of things or a whole lot of nothing and also decide who and for how long you’ll be doing it with. It may not be the Love Boat, like on TV. You probably won’t find a shipboard romance. There won’t be a Captain Stubing or Cruise Director Julie. Doc is dead so he won’t be there. Gopher became a Senator and Isaac gave up his lucrative bartending gig to do 300 seat theater shows in LA, but still, if you’re feeling lucky, poke into the lounge show on the Lido Deck and Charo might be there performing the Coochie Coochie song. What’s better than that? Nothing. Absolutely nothing.